The Oxen Group is liking a bearish market or at least a somewhat sideways market. The market has jumped up for three straight days, and a technical pullback with investors taking profits may be in order. One area that appears fundamentally bearish is the housing sector. Ultrashort Proshares Real Estate (SRS), which is a housing/commercial real estate ETF, looks to be bearish on a general market trend as well as news that foreclosures are continuing to rise to now 15% for the year and 33% in June. The trend is not stabilizing, which while not directly affecting commercial real estate means that commercial real estate is in a tough spot, as well. Futures are currently registering in the red, and we did not have any large market moving earnings or news come out in after hours. Further, news that CIT Group has failed to get lending and will be filing bankruptcy shows that the recession may still be taking more victims. Many earnings are coming out in the morning, but not a marquis name that could really drive the market higher except perhaps JPMorganChase. Economic data being released could further influence a pullback if jobless claims come in under expectations. Even if jobless claims are good and JPMorgan is solid, investors will be looking to sell these stocks into this upward trend. SRS, however, is in the exact opposite boat. 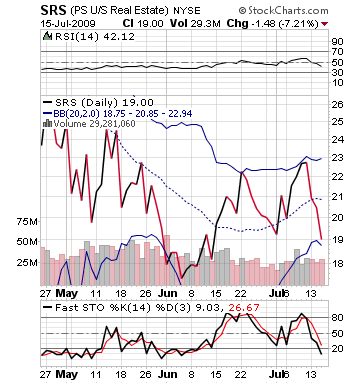 The ETF is extremely undervalued, just passed under a lower bollinger band, and is way oversold. Therefore, it is setting up for a perfect buying opportunity. Entry: Recommend buying in 15-30 minutes into session. Exit: We recommend exiting after a 2-5% increase.